The big trend in wedding gowns has always been embellishment, but this year, 3D cut-out floral embellishment is the hottest of hot trends. Whether it’s an overlay on your gown, floral embroidery paired with an illusion neckline or laser-cut detailing sprinkled along your hemline, it’s a fantastic way to make a romantic look more modern, says Wedding Inspirations editor Julia Boltt. Explore delicate details that stand out on sheer fabrics and help to create an elegant look and feel. Team your stunning gowns with a pair of statement earrings or a striking cuff bracelet and the impression is complete. Delicious, scrumptious flavours are definitely a big hit for 2016. 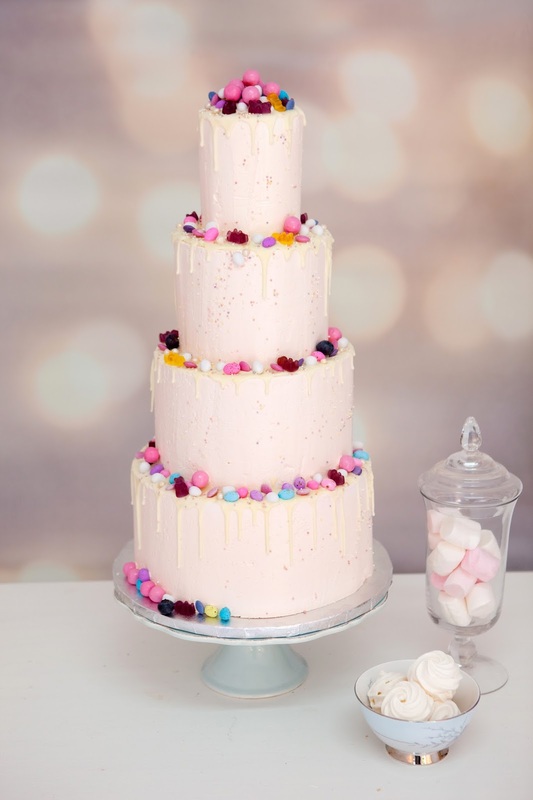 “We’ve seen the naked cake and buttercream cake as big trends in 2015, we’re still seeing lots of these being ordered for 2016 but now these trends are oozing with yumminess. We’re adding lots of chocolate- , strawberry- or caramel drizzle to the naked- and buttercream cakes as well as berries, fudge, Oreos, meringues, caramel popcorn etc. as decorations,” comments Wedding Inspirations contributor Maggi Badenhorst of Edible Art Cakes (www.edible-art-cakes.co.za). Whether it’s in stationery, décor, flowers or even in a daring dress detail, metallics are the hottest trend of 2016, and while no one is forgetting the classics, gold and silver, it’s the softer tones of copper and bronze that are making a splash! “These softer tones lend themselves to a romantic, free-spirited and dreamy look. 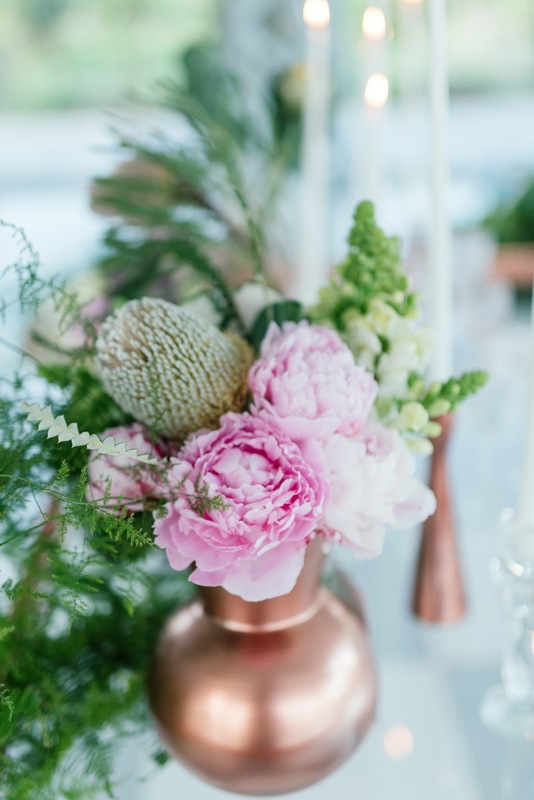 Metallics are really fun to use and old pots can easily be sprayed to create interesting centrepieces,” notes Wedding Inspirations contributor, photographer Debbie Lourens (www.debbielourens.com). Romantic rose gold is often combined with Pantone Colour of the Year 2016 Rose Quartz for a flattering and gentle, yet contemporary palette that suits every bride. Personalised stationery is making a splash, with watercolour invitations decorated with beautiful floral patterns and soft natural hues proving hugely popular. “We are also moving away from detailed vintage designs and towards more simplistic invitations embellished with geometric shapes, big and bold calligraphic names and a touch of gold, silver and even bronze. Light shades of blue are becoming very popular, especially duck egg blue, and it is easy to see why. This stunning colour will keep the groom happy while the muted tones make the design soft, elegant and romantic. This is an enchanting and versatile colour that is not restricted to a single season or style,” remarks Wedding Inspirations contributor and stationery designer Bianca from Pistachio Designs. Another adorable trend is personalisation, with couples putting their own individual stamp on their ceremonies and receptions. All the details speak to who the couple are – it’s about creating wedding memories that are very intimate and unique. Whether it’s creating a unique monogram, hand-writing thank you notes to guests or including details in the wedding that reflect their journey as a couple – a menu item with special meaning – it’s a heartfelt trend that makes your special day all the more meaningful. All this and more will be on display and for immediate booking at the upcoming The Wedding Expo, Moses Mabhida Stadium on 6-7 Aug 2016 in Durban, South Africa. Follow them on Facebook.com/theweddingexposa, Twitter (@weddingexposa), Instagram (The_Wedding_Expo) and Pinterest (TheWeddingExpo) for more information and to keep up to date with new announcements and features coming to The Wedding Expo in 2016.